Given the currently low transaction volume, the liquidity of CRE investments is poor, thereby increasing the risk and the spread between cap rates and Treasuries. Tight underwriting standards, low debt-to-value ratios, and the overall lack of available capital further contribute to a large spread. Looking at the pressures on Treasuries, historically they have been expectations of future inflation, general economic health, and market forces of supply and demand on the debt of the U.S. Government. In addition, the Federal Reserve exerts its own pressure to spur or slow economic growth by setting pricing for short-term lending, thus applying pressure on the 10-year Treasury. Currently the Fed has only a third of its assets in Treasuries, reducing its influence on Treasury pricing. 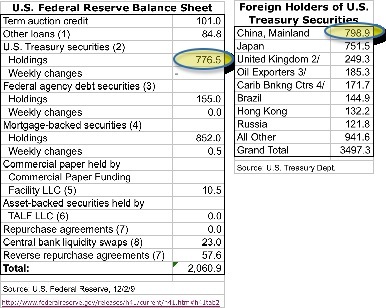 From the two tables below, it is clear that the Fed holds fewer U.S. Treasuries than China, and only slightly more than Japan. Markets are not entirely transparent. While individual trades through exchanges are reported and can be tracked, the activities leading up to the placement of a trade order are not visible. It is not entirely possible for example, to know precisely who is watching whom. Because of this, we don't know who the real leaders are in orchestrating plays to drive pricing up or down. That said, it is clear that some players have more control than others. PIMCO manages large bond portfolios for institutional investors and due to their scope and perceived expertise, wield tremendous power. With great power comes great responsibility, and in a well structured market, a lot of regulation and oversight. If PIMCO wants to continue to operate in the U.S., they need to continue to follow every regulation and behave as responsibly as possible. So in a way, their power is heavily restrained, preventing them from exercising that power. In contrast, the People's Republic of China does not face the same degree of obligation in opening themselves to scrutiny by U.S. financial regulators. China owns a lot of U.S. Treasuries. They have the power to move the market. They also have the freedom to exercise that power. Finally, the concentration of political power within China means that a small group of individuals have the ability to make decisions and execute on those decisions. This combination of factors makes the Chinese Central Committee the largest single potential influence over U.S. bond, and therefore, commercial real estate pricing. The important question then, is what does China intend to do? To answer this question, we can look at the past for similar situations where China has taken pricing control of certain commodities markets. Better still, we should explore the motivations of the Chinese Central Committee, from as close to their perspective as possible. Shed any cold war mentalities and prejudice, and look at what China has accomplished, and what it proposes to accomplish in the coming age. Chinese culture is an eclectic mix of hundreds of legacy kingdoms and peoples, forced together over the millennia through hostile bordering enemies, famine, natural geographic boundaries, and a more or less common vision. Much of the population persists in medieval agrarian lifestyles lacking the benefits of modern medicine, technology and communication. To elevate the population, the government has experimented with free-market economics, massive development projects, and the largest urbanization program in the history of the world. By most measures, they have been successful. China's GDP, growing at an annual rate of 10.5% from 1996 through 2006, has outpaced Europe, the U.S. and most other developed nations. The consistency of that growth was cause for skepticism, but increased reporting and transparency has quelled much, though not all of that skepticism. In any case, the perception is the effective reality. That success however, is also a great challenge. The Chinese population, some 1.3 billion people, has come to expect continued growth and improved levels of prosperity. So far, that growth has come from a combination of increased internal consumption, and exports. The trade imbalance between China and the Western World has contributed to a tremendous redistribution of wealth. Every time we buy another load of goodies at Wal-Mart, China gets a little richer. Currently the U.S. has a GDP per head of $43,730 compared to $2,000 for China. Such a disparity in an increasingly connected world is dangerous. As China grows wealthier, it becomes a more stable global partner, albeit a more competitive partner, scrambling for access and control of the same natural resources. From the Chinese perspective, the U.S. is a very important source of income. But the U.S. is not the sole or even primary focus of the Chinese government. China's main focus is on its people. The quid pro quo between government and the governed is that the government is allowed to retain power as long as it delivers on its promises. No amount of military force can long overcome a failure to deliver. It is this tension that we need to explore further. The promise made by the Chinese Central Committee is that it will continue to deliver the double-digit growth, and improvements that the population can truly enjoy. The urbanization program is central to that delivery as the requirements for a manufacturing based economy are optimized in a more urban structure. It is therefore imperative that the urbanization program continues. A few years ago I visited a new city being built between Shanghai and its port. It was striking in the scale and detail of construction. Even though no one yet lived there, a beautiful park at the edge of a lake offered areas for strolling and picnicking, and even a sign prohibiting barbeques on the grass. Today that city houses over 100,000 people. So far, the construction has been financed without significant debt. 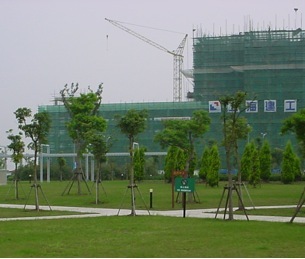 In fact, foreign investment into China prohibits ownership of property. Instead, developers such as ProLogis and others are allowed to build on leased land, with many layers of restrictions and no small degree of corruption from local officials requiring dubious permits and licenses. Experienced practitioners are able to navigate these restrictions, and the payback for investors has been solid. But the Chinese themselves, using the income from their ever-growing exports base, finances the majority of the building. As the global economy slows, demand for China's products wanes. China can not slow its development projects. The Chinese population will not accept a slowdown in growth due to outside influences. The population will continue to demand payment on the promise of growth, and push their government to the same solution other governments around the world have relied upon, namely, government backed debt. The Chinese government may be forced to raise capital by issuing bonds. I suggest that while Chinese culture is far less enamored with debt than the west, they are not completely averse to the concept. So what would the issuance of Chinese government bonds do to the pricing of Treasuries, and therefore to commercial real estate? First of all, for the investment community to be willing to purchase the new, untested bonds, they would require higher rate of return than the U.S. backed bonds. So with U.S. 10-year Treasuries yields under 3.5%, the risk premium for the Chinese bonds would put them at say, 5%. For China, a 5% interest payment over ten years is an easy bet given their double-digit growth rate. To make the offer even more enticing, they may be willing to issue them at 6%. Then investors would be far more willing to buy a Chinese Treasury than a U.S. Treasury, forcing the U.S. to issue bonds with a rate of perhaps 4.5%. In this way, the Chinese issuers would be able to exert upward pressure on the pricing of U.S. bonds. If however, they wanted to depress the rates of U.S. treasuries, they could convert some of their holdings and purchase even more U.S. bonds. It is clear that they have the very real ability to put substantial pricing pressure in either direction. In fact, they have the ability, and perhaps the motivation, to control pricing of global financial markets in much the same way as they have taken control of commodities. The scale of the Chinese economy, and the centralized control over both supply and demand, puts China in the drivers seat. This apparent threat is yet another consideration in forecasting commercial real estate (CRE) pricing. For the investor in CRE, it is still an enticing asset class, given the ability of CRE rental income to adjust to inflation better than most bonds. For a long term buy and hold strategy, we are entering a period of excellent opportunities for acquisitions. Recognize that while prices are likely to continue to decline for as long as five quarters more, a stabilizing employment picture means that income from rents is unlikely to decline longer than that. Once you have purchased a property, changes in cap rates do not affect the income the property generates. If you are willing to tolerate a loss in sale value, you can continue to generate a high rate of return through the income generation of the property. Solid research and a firm understanding of the concepts will help you avoid costly mistakes. For the long-term investor, the time to buy is imminent. A recent report from Real Capital Analytics highlighted the spread between core and value-add properties in terms of pricing and cap rates. Value-add properties are a euphemism for underperforming properties that could benefit from upgrades in physical plant, management, or leasing effort. When well executed, these upgrades can result in higher returns. Poorly executed, you have dumped more money into a bad investment. Core properties provide consistent income and are still commanding premium prices. Clearly, the market for commercial real estate has already priced in the value of a reliable income. 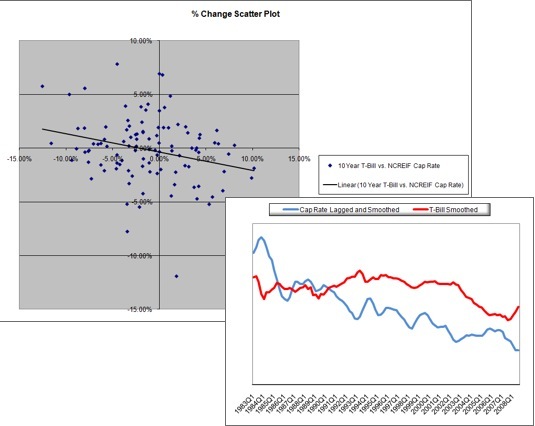 So while fluctuating cap rates, moving with large global forces will affect sales pricing, the fundamentals of rents and vacancies will still control the income on commercial real estate. For now at least, there is little likelihood of a profitable quick flip on a property. Real estate is once again, a long-term investment.